Our recent work is converging on the relationship between red coloration and colour vision in various vertebrates. We found that the CYP2J19 locus that underlies red carotenoid coloration in birds first evolved in the archelosaur lineage, the clade containing birds, turtles, crocodiles and dinosaurs (Twyman et al. 2016). However, the first function of CYP2J19 was not in red coloration, but for the carotenoid-containing red oil droplets in cones in the retina. These red droplets act as filters in long-wave sensitive cones and lead to improved colour discrimination at long wavelengths. 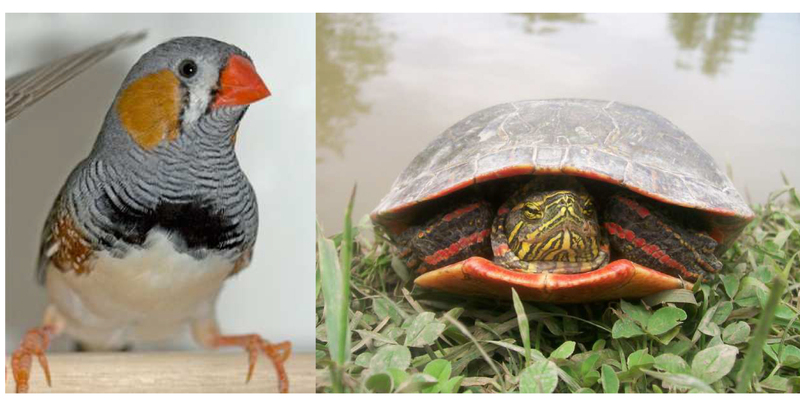 In birds and turtles, CYP2J19 independently gained a second function for red coloration. Meanwhile, our work on colour vision in bald uakaris (further details here) has raised the intriguing possibility that female colour vision has evolved to identify healthy males from the intensity of red coloration of their heads. We are now investigating potential coevolution of colour vision and coloration in poison-dart frogs, and weavers.